To participate in this conference, please send your 500 word abstract by filling the Taqreeb Conference Submission Form below by 05 August, 2017. All abstracts must be in English. QJSP is pleased to offer accommodation and local transport for participants. 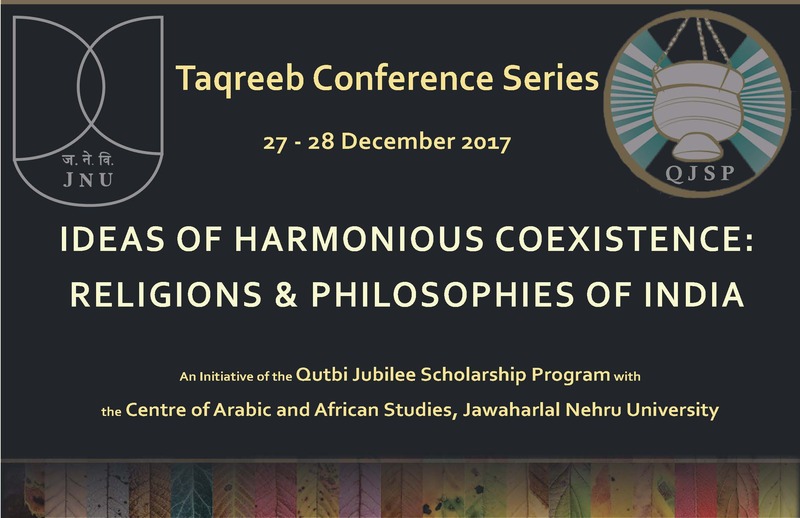 The Jawaharlal Nehru University (JNU), New Delhi, in collaboration with the Qutbi Jubilee Scholarship Program (QJSP), Mumbai, invites the submission of abstracts for a conference on ideas of harmonious coexistence in the religions and philosophies of India.The purpose of the conference is to bring together scholars and community leaders to explore notions of communal harmony in India, as theorized and practiced, historically and today. The conference would create a platform to connect these notions to contemporary challenges to peace and pluralism. If you need translation help or have any other questions or comments please send us an email and we will get back to you shortly. Please makes sure to review the detailed CALL FOR PAPERS below. The Indian sub-continent across the millennia has been a cradle for the development of myriad systems of thought with regards to interfaith and intercommunal relations. For many, the sub-continent has served as a model for communal harmony, and for others, it has often been a focal point of disharmony, rioting and discrimination. Philosophical and religious luminaries, as well as rulers and politicians, have throughout its history formulated ideas of harmonious coexistence, and often implemented them. These have, frequently but not always, been erected upon edifices of faith-based ideologies. From ancient scriptures such as the Rigveda, to more recent ones such as the Bible and the Qur’an; from the religious traditions that emanated from within the sub-continent, such as Hinduism, Buddhism, Sikhism and Jainism, to those that made it its home, such as Islam, Christianity, Zoroastrianism and Judaism; from the ancient philosophical traditions of the astika and nastika schools, to the later expressions of Sufi and Bhakti ideologies; from the sayings of kings and emperors such as Ashoka, Kharavela, and Harsha, and the concepts of sulh-e-kul and din-e-ilahi of the Mughal Emperor Akbar, to the provisions of the Constitution of India, the Indian Penal Code and Parliamentary Acts; from the sages of medieval India such as Khwaja Moinuddin Chisti, Baba Farid, Guru Nanak, Tulsidas, Mirabai and Dara Shikoh, to the more recent perspectives of Sai Baba of Shirdi, Mahatma Gandhi, Syedna Taher Saifuddin, Maulana Abul Kalam Azad and Pandit Jawaharlal Nehru, the multi-religious, multi-lingual, multi-ethnic and multi-cultural society of India represents a rich tapestry of ideas of harmonious coexistence. These ideas and their successful and unsuccessful applications across the ages represent an invaluable resource for the debate on communal relations in contemporary times. Their considerable legacy can today contribute on micro and macro levels to the mission of advancing communal harmony in modern day democracies in general, and particularly to issues of intra-societal and intra-faith relationships, interreligious and intercommunal co-existence, minority and majority rights, and nation building in India. In present times especially, two dichotomous strands of thought have increasingly taken hold and demand immediate attention: on the one hand, ultra-orthodox and other extreme ideologies are finding more and more opportunities of expression, and on the other, the more liberal voices have progressively moved from a call for tolerance and patience amongst communities to urging acceptance, appreciation and understanding. Furthermore, several distinct strategies are being put forward today in the public space for achieving harmony, and these deserve careful individual consideration: some suggest that the best way forward is to show that all religions are an expression of the same truth, while others advocate a healthy recognition of the commonalities as well as the differences, and yet others argue that the focus of individuals should be on being human, while realizing that religious boundaries are artificial and man-made. 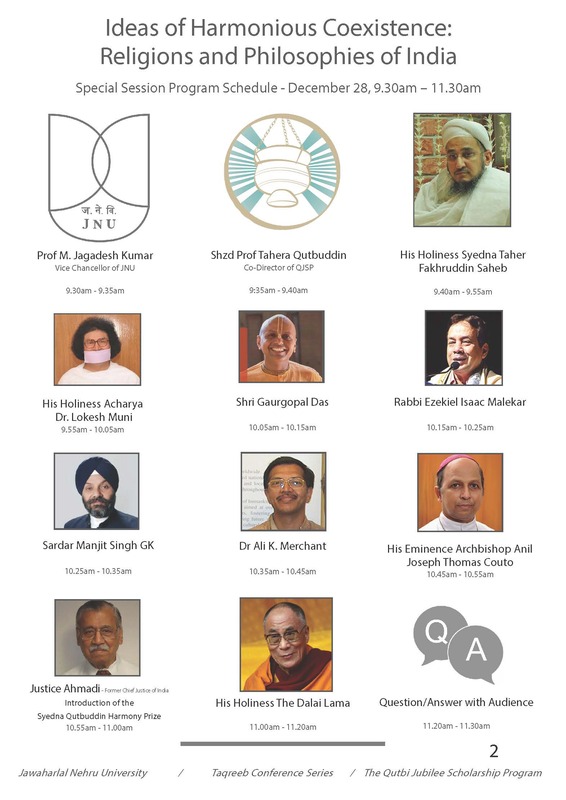 In the conference, it is hoped that questions such as the following – but not limited to these – will be closely examined and discussed particularly in the context of contributions that have come from the religions and philosophies of India: how can one define ‘harmonious co-existence’ as well as its aims and goals historically and today; how do notions such as ‘tolerance’ and ‘patience’ versus those such as ‘acceptance,’ ‘appreciation’ and ‘understanding’ shape such definitions; how can one endeavour to reconcile between competing definitions and goals; what are the prime examples of communal harmony in history and today; what are the ideas that have been put forward to achieve communal harmony, and how do they address the socio-economic, racial, religious, educational, political and caste fault lines of society; what is the role of syncretic developments in religions, ideologies and cultures in moving towards harmonious coexistence; what have been the points of failure historically and today where community relations have broken down and even disintegrated in to violence; how do such instances contribute to a search for harmonious coexistence; what have been the points of interaction between ideologies of harmonious coexistence and those that propagate divisiveness; what has been the role of politics and phenomena such as colonialism and nationalism in advancing or harming communal relations; how does one balance the seemingly divergent ideals of freedom of speech and communal harmony, as for example attempted in Section 153A and 295A of the Indian Penal Code; what is the role of the government, NGOs, media, law enforcement and the justice system in advancing this goal; how significant is harmonious co-existence in nation building and development; what are the concrete initiatives and steps that can be taken today in fostering communal harmony.